It’s one of the most memorable days of your life. You just found and dedicated yourself to the person you want to be with forever and soon, wedding bells will chime. But there’s a lot of planning that’s going to have to go into this special day: the dress, the wedding party, the bow-ties, the family, the DJ, the location, the bachelor and bachelorette parties, the rehearsal, and the reception. Often, the reception is the most expensive part of all. Not only do you need to entertain and find a place to fit all of your family and friends, but you need to feed them, too. We’ve all been to a less-than-spectacular wedding before; where you may have been afraid the food was going to eat you before you ate it. No one wants their guests to feel this way. Everyone wants their guests to have a fun, memorable time. One way to ensure this is to choose a cool and quirky catering option. Honk, honk! The food’s here! 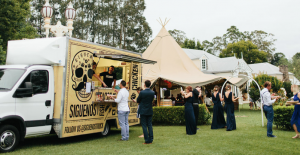 If you’re not looking for a traditional wedding, or want a fun, funkier reception to compliment your classic, romantic ceremony – research local food truck options. Food Trucks are a great option for weddings. They’re different from a typical served or self-serve catering service and they add childlike charm. The catering service is already mobile so it can meet you no matter your destination, there’s no worrying about providing place settings, because their service comes with this included. The experience will remind your guests of ordering their favorite cold, sweet treat from the ice-cream truck as a child, and your reception will automatically incur a fun, easy-going theme. Food trucks are often colorfully decorated, as well, and can feature unique menus typical wedding catering companies may not offer, such as: Asian fusion, BBQ tacos, or simply classic cheeseburgers. The employment of a food truck is sure to inspire compliments and enthusiasm from your guests. Plus, a photo of you and your newly-instated spouse in front of the food-truck will create a quirky, cute image for you to remember forever. No, not cheesecake. Cheese cake. If you’re not that big of a sweet-tooth or not a cake fan in general, or, perhaps, your opting for easy-to-eat dessert option such as cookies or cake balls – in any regard, a cheese wheel cake is both a funny spin on the typical and a delicious option for you and your guests. It’s easy to execute, as well. Simply purchase at least two to three cheese wheels and place them on top of each other according to their size, largest at the bottom, medium-sized in the middle, and smallest on top. 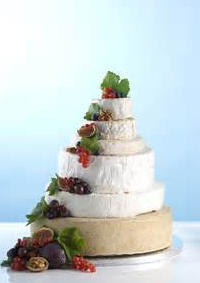 Cheese with white or ivory rinds works best to give it the illusion of a wedding cake, such as brie or white cheddar. You can even add decorations to the interesting cake, such as roses or fresh herbs. This idea pairs especially well if you serve it alongside a charcuterie board, with accompaniments like honey, figs, stone-ground mustard, freshly-baked bread and olives. This refined feast will satisfy and would work remarkably well served during a cocktail hour. A cheese cake can also act as an unordirary present for someone you like or love 😉 Of course you need to know the taste of the person and if he/she likes such kinds of presents. For more normal yet stylish presents I recommend this site – especially if you need a gift for a romantic occasion. These have been gaining popularity with brides and grooms over the past few years because it ensures the guests will enjoy their meal, especially if you have any picky-eaters in your family or group of friends by lending them reins to add as much or as little of what they enjoy. Some examples of great build-your-own bars would be: nachos, salads, ice cream sundaes (as a dessert option), and many others. 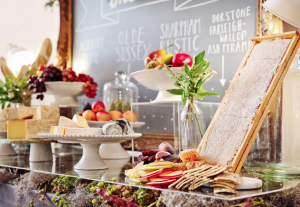 This wedding food trend is perfect for a wedding hosting many, because it can offer lots of options. Guests can pile their nachos with veggies only as a vegetarian options, others may opt to have their nachos piled with beef or grilled chicken. This gives your guests the power to be creative and cater to their tastes so you don’t have to.